I didn’t intend to become a solo hiker. It happened as a matter of circumstance. I was single, and most of my friends were married with babies and small children. 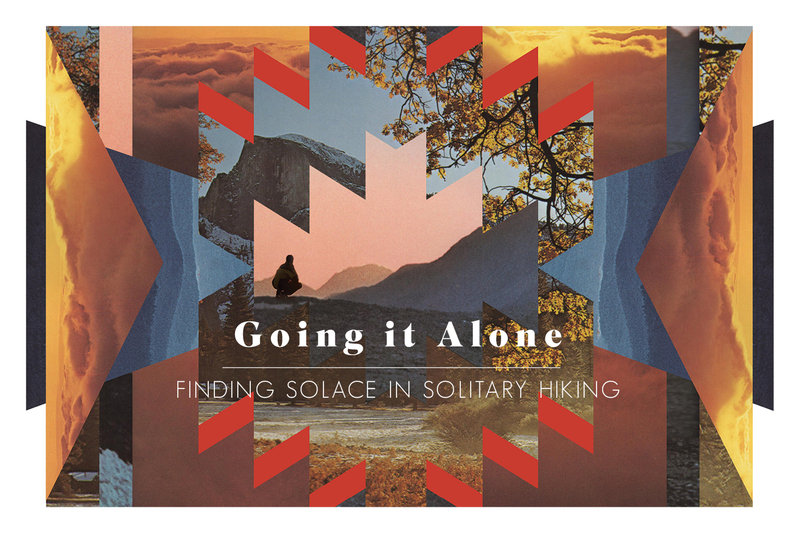 Their lives didn’t much allow for day hikes, let alone a weekend trip in the backcountry. I’m shy and not much of a joiner, so hiking clubs didn’t appeal to me. I started setting out on my own long day hikes, but soon got a little bored. Seeking a new challenge a little farther afield, I planned a camping trip with a friend who also wanted to hike to the top of Mount San Jacinto, one of southern California’s highest peaks. I arrived in Idyllwild where we planned to meet and checked my phone. My friend was sick and wouldn’t be able to join me. Thanks to an encouraging park ranger, I went to the top of the mountain alone and had one of the most rewarding walks of my life. Not only did I feel a tremendous sense of accomplishment, but an aspect of myself that had previously been closed off to others was suddenly open and alive. On my way down the mountain, I stopped to chat with people along the way and spent a while in the parking lot speaking with rock climbers who were hanging out there. Over beers and burgers with a couple of them in town, I thought how much fun it was to meet these people whom I never would have met if my friend had been with me. It was unlike me to join up with strangers, and I welcomed the unexpected transformation. My walk on Mount San Jacinto was a turning point for me. I understood after that weekend that my long walks on mountains were changing me for the better. The freedom and happiness I found in the mountains was beginning to follow me into my frontcountry life, and the chronic dissatisfaction I had with my work as a museum curator evolved into motivation toward a radical life change. I no longer felt trapped in a hopeless situation, and I used my free time ━ and a considerable amount of time at work, I don’t mind admitting ━ to plan my weekend adventures, which would alter the course of my life toward new levels of creativity and independence. Not only had my life goals become clearer, but I was also more relaxed and less reactive. I had become friendlier and more open to connecting with other people, both strangers and those close to me. The key to all of this was not walking up mountains per se, but what I found in myself along the way. I could have chosen anything as a palliative remedy to my restlessness, but my natural evolution from casual rambler to committed long distance hiker was more a calling than a choice. I began to have intense cravings for the sense of internal transformation that accompanied my walks. I read guidebooks like they were novels, searching for challenging terrain and beautiful scenery. I daydreamed about the places I could go on my own two feet. I decided to become a backpacker. For my inaugural outing, I was accompanied by my friends Jennifer and Peter, a married couple who are both lifelong backpackers. We quickly fell into a rhythm, each of us walking at our own paces, meeting up now and then to take a rest. I liked the social dimension of walking with others. Walking in a group necessitates discussion and consensus, which I found fulfilling. The company of others provides a degree of comfort, an outlet for voicing one’s thoughts in the moment, and the opportunity to commiserate. On the other side, it’s difficult to access the remote internal summits with other folks around. I was glad to strengthen my friendships with Jennifer and Peter, but I also missed the solitude I had grown accustomed to finding on my walks alone. Once I learned the how of backpacking, I became a seeker. I looked for challenges that would give me the opportunity to test my physical and mental endurance, my strength and wherewithal. I decided to thru-hike the John Muir Trail, a 221-mile footpath running through the Sierra Nevada from Little Yosemite Valley to Mount Whitney. I wanted to do it alone. As such a beginner, I knew the undertaking would require masses of training and logistics, and the JMT became my primary focus for six months. I made an end-to-end traverse of the 13-mile Verdugo range, took overnights to Cucamonga Peak and Mount San Gorgonio, and completed countless day hike summits of Mount Baldy. I went to the Grand Canyon and did a Rim to Rim in a day hike from the south to north sides of the canyon and back the next day, a total of about 50 trail miles and combined 20,000 feet of elevation gain and loss in around 36 hours. I did all of these things by myself, but the John Muir Trail tested the boundaries of my tolerance for solitude. Traveling alone, I have the chance to meditate for extended periods of time, but I am also more inclined to engage with strangers. The encounters I have with other hikers have shown me a dimension of human character that I don’t often get to experience at home in Los Angeles. There is an almost immediate connection with other hikers. We are all experiencing the joys and hardships of carrying our homes on our backs into an expansive wilderness. We are all vulnerable to the elements and conditions, so we all depend on one another for information, help and encouragement. On my first trip to the Grand Canyon, I met a trio of Canadians who shared a secret swimming hole with me and loaned me a much-needed tent peg. Complete strangers to each other, we shared our stories and dreams at the edge of the Colorado River. We toasted the sunrise on the South Rim with tequila and have been friends ever since. By chance, I wound up camping three nights in a row with another solo hiker on the John Muir Trail. Tracey and I ate supper together and swapped ideas about ultralight gear and cooking methods. While she walked the JMT, her husband explored mountain lakes, fishing his way down the Eastern Sierra in a camper with their dog. After parting ways one morning, I thought I’d never see her again, but we crossed paths on our final day on the dramatic two-mile traverse out to the summit of Mount Whitney. It was like running into a cherished friend I hadn’t seen in years. Concerned about a dangerous river crossing I had to make on the Timberline Trail in Oregon, I was happy when I came across another hiker coming in the opposite direction. While he was giving me valuable information about the best place to cross, I remembered that it was my birthday. He looked at me in disbelief and told me that his birthday had been the day before. We had both come to this mountain to spend our birthdays alone and became instant friends. This year, we wished each other a happy birthday via email before each of us headed out for our yearly birthday adventure. Now that I am a more experienced backpacker, I anticipate my encounters with other hikers almost as much as I look forward to my solo meditations. In my experience, the subculture of hikers is a model for an ideal society. The wilderness is filled with compassion, generosity and kindness. In addition to treating each other well, hikers generally follow a code of conduct that brings out the best in people. The concept of Leave No Trace (LNT) was developed as a set of practical guidelines to help preserve wilderness areas. The seven principles are to plan ahead and prepare, travel and camp on durable surfaces, dispose of waste properly, leave what you find, minimize campfire impacts, respect wildlife, and be considerate of other visitors. It’s that last one that makes all the difference when it comes to relating to others. I believe that everyone can benefit from spending time in wild places, and the more people seek out wilderness experiences, the more important it will be for everyone to follow LNT. I also believe that by connecting with others in these settings, we are able to connect more with ourselves. I often wonder how radically we could change our world for the better if we all adapted and adopted LNT practices in our daily lives, no matter where we are. If all of our decisions — from what we eat to where and how we live — were guided by these ideas, imagine how we could transform our lives, our communities and our world. This article was originally published in RANGE Magazine Issue Four.